​When valves in the superficial veins cease to function, resulting in ambulatory venous hypertension, the vein with the “bad valves” must be taken out of the circulation in order to halt the progression of pain, varicose veins, edema, and skin damage. Traditionally, this was accomplished by surgical removal of the vein, or vein stripping. With the development of new technologies which reduce morbidity, vein stripping has become a seldom used technique. By eliminating the dilated, refluxing vein, venous blood is diverted into veins with normally functioning valves. Thus, pathways with reflux and venous hypertension are replaced by new pathways of veins with normal valves and pressures, ending pain and swelling, and allowing damaged skin to heal. The endovenous techniques now considered to be the “standard of care” for treating chronic venous insufficiency are designed to damage of vein from the inside. Rather than removing a vein using surgical incisions, modern technologies are minimally invasive, requiring no more than a needle to access a vein. Eliminating the surgical trauma means little or no pain, during or after the procedure, and no downtime. Furthermore, because general anesthesia is not required, these procedures are now done in a comfortable office setting, without the great expense incurred at a hospital or surgery center. Destruction of the diseased vein from the inside is called endovenous ablation. This can be accomplished in several ways. The technologies are grouped into thermal (heat) and non-thermal ablation. The advantages and disadvantages are presented in the table below. Thermal ablation remains the gold standard and has a relatively long track record. The VNUS Closure radio frequency catheter was approved for use in the US in 1999. The Diomed laser entered the market in 2002. 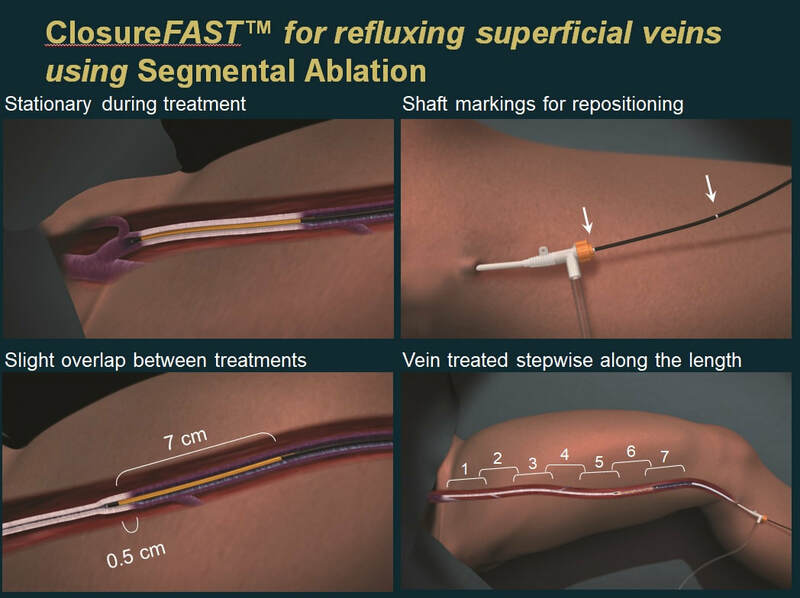 These systems achieve long-term vein closure rates exceeding 97%. There is nothing more effective than thermal ablation for treating veins above the knee. The only significant difference between the thermal technologies is the post-procedure pain and bruising observed with laser, not typically seen with radio frequency ablation. One claimed advantage of the non-thermal ablation systems is elimination of the need for local anesthesia, except at the vein entry site. The benefit is minor. The main advantages of non-thermal ablation are the ability to safely treat veins lower in the leg, and, in the case of Varithena® microfoam, the ability to treat tortuous veins that will not accept a stiff, straight catheter. Vena-Seal glue may be found to reduce the number of residual varicose veins requiring phlebectomy, and post procedure compression is not necessary. Vascular Insights Clarivein® infusion catheter has a rotating wire which scores the inside of the vein, making it more susceptible to damage from a sclerosant, which is injected through the same catheter as it is being pulled back through the vein. This catheter can be inserted through healthy tissue above an area of damaged skin and directed down toward the foot. The dispersal of sclerosant helps in treating abnormally dilated veins deep to a leg ulcer. A typical thermal ablation of the great saphenous vein, such as with a radiofrequency catheter, relies upon the use of ultrasound for vein access, catheter positioning, and delivery of local anesthesia. The vein is accessed with a needle, which is replaced by a “port,” allowing insertion of the catheter. The catheter is usually inserted further down the lower extremity and advanced toward the groin. The catheter is positioned well below the junction of the saphenous vein and common femoral (deep) vein, to reduce the incidence of a complicating DVT, which occurs in only about 0.001% of thermal ablations. Local anesthesia is administered around the saphenous vein with ultrasound guidance. The radiofrequency generator is then activated, heating a 7 cm element at the end of the catheter. After 20 seconds of heating, the generator turns off, the catheter is withdrawn 6.5 cm, and another cycle of heating is carried out. This “segmental” heating is repeated until the entire length of vein has been treated. During pullback, the heating element is inactive. With a laser fiber, the heat leaves the fiber at its tip and pullback is continuous, with the laser heating of the vein uninterrupted until completion of treatment. After two decades of evolution, multiple technologies are now available to treat chronic venous insufficiency efficiently, safely, and without significant post-procedure pain or downtime.